Some youngsters throw tantrums and some never do. 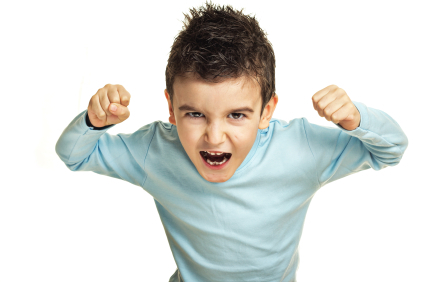 Youngsters throw tantrums as a way of expressing anger and frustration. If the behavior is dealt with incorrectly, the youngster may learn to use tantrums to manipulate people and to gain attention. In dealing with tantrums, the ultimate goal is to teach the youngster acceptable ways of expressing anger. Don't let the disapproval of other people affect your response to the tantrum. Isolate the youngster if possible. Stay calm and ignore the behavior to the extent possible. When your youngster throws a tantrum, she is essentially out of control. You must make sure that you stay firmly in control. Punishing the youngster for throwing a tantrum, by yelling or spanking for example, makes the tantrum worse in the short term and prolongs the behavior in the long term. Trying to stop the tantrum by giving in to the youngster's demands is even worse. This is the way to teach a youngster to use tantrums for manipulation, and will cause the behavior to continue indefinitely, even into adulthood. When the youngster throws a tantrum at home, calmly carry her to a place where she can be left safely by herself, such as a crib or a playpen. Then leave the room, shut the door, and don't go back until she calms down. When the youngster is calm, have a talk with her about her behavior. If you don't feel safe leaving the youngster alone, stay with her, but don't respond to the tantrum in any way. Don't even make eye contact. If the youngster throws a tantrum in public, carry him out of the public area if possible, and take him to a place where you can have some privacy. The best place to take him is to the car, where he can be buckled into his car seat. Then you stand near the car or sit in the car and wait it out without reacting to the tantrum. When the tantrum subsides, talk to the youngster about his behavior, and then return to your activities. Sometimes it won't be possible for you to escape from the public place easily. For example, if you are in a commercial jet and the youngster throws a tantrum while you are coming in for a landing (as my daughter once did), you are basically stuck where you are. Likewise, you may find it hard to escape if you are standing in a long check-out line at the grocery store with a cart full of groceries. Under such circumstances, all you can do is grit your teeth and hang on. Ignore the screaming youngster. Ignore the glares and snide remarks of the people around you. Keep your cool. (Anyway, a screaming youngster in a check-out line speeds it up, so your youngster is actually doing everyone a favor.) Once you are able to make your escape, talk to the youngster about his behavior. Once your youngster has settled down, you and she need to have a talk right away while the memories of the episode are still fresh in her mind. She threw the tantrum because she was angry or frustrated. Don't get into the issue of why she was angry or frustrated. Concentrate on the tantrum itself, explaining to the youngster that the behavior isn't appropriate. Then teach her what she should do instead when she feels angry. This works with youngsters of any age, even toddlers. Your toddler will understand you. Toddlers understand far more than they are able to express. First describe the behavior: "You felt angry and you threw a tantrum. You were screaming, throwing things, and kicking the walls." You say this so the youngster will understand exactly what you are talking about. Then you explain that tantrums are not proper behavior. Make sure that you are clear that the tantrum is bad, not the youngster. "Tantrums are not appropriate behavior. In our family, we don't scream and throw things and kick. That behavior is not acceptable." This has an impact on the youngster, because your youngster wants to do the right thing. You help her by explaining that tantrums are the wrong thing. And don't worry about using big words such as "appropriate." If you use big words with a youngster, the youngster will learn big words. If you use only little words, your youngster will learn only little words. Then give the youngster some alternatives: "I know you felt angry. When you are angry, what you do is say, 'I'm angry!' Can you say that?" Have the youngster repeat the phrase after you. Next review what you have said. "What are you going to say next time you're angry?" Get her to repeat the phrase, "I'm angry!" Then say, "Next time you're angry, are you going to scream?" The youngster will probably say or indicate "no." "Next time you're angry, are you going to throw things?" "Next time you're angry, are you going to kick?" End up with, "Tell me again what you're going to do next time you're angry." You will have to repeat this discussion many, many times. It takes a long time for a youngster to learn how to control a temper tantrum. You may notice after awhile that certain settings and circumstances seem to precipitate your youngster's tantrums. My daughter, for example, always threw tantrums when we went to a restaurant. You can prevent tantrums by talking to the youngster beforehand. Explain to the youngster what you are about to do. ("We're going to go have lunch at Taco Bell.") Then tell the youngster what kind of behavior you expect, putting your expectations in positive terms. ("At Taco Bell, we're going to behave well. That means we will be polite, speak quietly, and use our words to ask for things and to say how we feel.") After you have told the youngster what you want, tell him what you don't want. ("We will not scream, throw things or kick. We don't do those things in public. It bothers people.") This tells the youngster not only what behaviors to avoid, but why to avoid them. Then get the youngster to agree to this. Say, "Now, tell me how you're going to behave when we go out. Are you going to speak quietly?" The youngster should indicate "yes." "Are you going to use your words?" "Yes." "Are you going to scream or throw things or kick?" "No." Then say, "That's great! We'll have a good time!" My daughter never once threw a tantrum if she agreed ahead of time not to. Run through this litany every time you plan to go out, because if you forget, the youngster will revert to tantrums in that environment! You: "I want a rocket ship to Mars." You: "Give me a rocket ship to Mars." You: "I'll give you candy if you give me a rocket ship to Mars." Youngster: "But this isn't real." You: "What you gave me wasn't real, either." Youngster: "But I don't have a real rocket ship!" You: "Well, I guess you're out of luck, then!" This may not work with every youngster, but it worked with my daughter. It's good for a youngster to learn that it's okay to want things, but it doesn't follow that a person always gets what he wants. Another way of dealing with the grocery store tantrum is to discuss treats with the youngster beforehand. Tell the youngster where you are going, and what kind of treats, if any, the youngster can expect to get at the store. You might say, "When we go to the store, you can select one lollipop, any flavor you like, as a treat." Make it clear that one lollipop is all the youngster will get. If you don't want the youngster to get a treat that day, you should tell this to the youngster ahead of time. A youngster will often accept not getting a treat if told beforehand. But make sure that whatever you tell the youngster before the trip to the store, you stick to it! Rescue Remedy immediately at the onset and continue as needed - incredibly helpful to help the child refocus and come back to center. I think that the most surprising thing for me too has been that strangers in public have been amazed at the resolve and patience needed to support a child through a meltdown. I am always grateful when someone tells me that they were impressed at how I handled it or something like that. I hold onto those little gems for times when I don't feel as patient and skilled. It's a great article, but I don't know about the advice on "making a game" of the demand. My Asperger's kid doesn't respond well to abstract explanations, and that's what the "rocket to Mars" seems to be. Yea... and you won't know until you try it. So - try it! And tell us how it goes. The more tools you try - the more tools you'll find that work (although not all tools will work of course). GOOD LUCK ! This is a great article to share with parents of my students. I have given some of this advice to them in the past but there a some other informative tips that will pass along. I think one of the most common fears among parents is not letting the disapproval of other people affect your response to the tantrum. They always have a hard time accepting the fact but eventually, they find it's worth it.